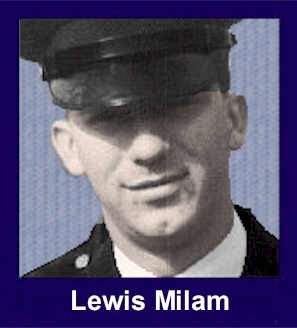 The 35th Infantry Regiment Association salutes our fallen brother, CPL Lewis Edward Milam, who died in the service of his country on March 21st, 1967 in Kontum Province, Vietnam. The cause of death was listed as Small Arms/AW. At the time of his death Lewis was 20 years of age. He was from Gadsen, Alabama. Lewis is honored on the Vietnam Veterans Memorial at Panel 17E, Line 8. The decorations earned by CPL Lewis Edward Milam include: the Combat Infantryman Badge, the Bronze Star with V, the Purple Heart, the National Defense Service Medal, the Vietnam Service Medal, the Vietnam Campaign Medal and the Vietnam Cross of Gallantry with Palm Unit Citation. Lewis grew-up in a little town community named Tabor about ten miles from Noccalula Falls, above Gadsden, Alabama. He was always a good kid. He loved to whistle from the time he was small. He would get his fishing pole, throw it across his shoulder, and off to the creek he would go. Sometimes when I took him fishing, I would have to remind him to stop whistling so he would not scare the fish off. He also loved to go hunting in the winter. He loved the outdoors. There wasn't a lot to do in this little community. They would play ball in a cow pasture. Lewis was there if he wasn't working. He had a wicked knuckle ball; there were not many that could hit that ball when he threw it! They also got together and played horse shoes at this little country store. Lewis and his Dad were champions of the horseshoe games. Lewis was engaged to a sweet little girl and planned on getting married when he returned. He had an older car that he was having restored; it is still there today. He was the last of the Milam's; they were trying to get him out of Vietnam and the Army did pull out a Milam but he was the wrong one. His mother grieved for him until the day that she died. His mother and Dad are both deceased. He has two sisters, one half sister, and two half brothers living. He also has nieces and nephews still living. He has a great-nephew named after him. Lewis was my half brother but to this day my heart aches for him. He had 52 days left to serve before he came home. We found out that he had made sergeant and do not think he knew it. Hopefully we will meet again in heaven. Corporal Milam was serving as a rifleman in the Third Platoon of Company C, Second Battalion, 35th Infantry, while on a search and destroy mission. While moving over dense, mountainous terrain, his platoon was engaged by a numerically superior enemy force. Corporal Milam reacted instantly, returned the hostile fire, and took cover. He realized that from his covered position, it was impossible to place effective fire on the enemy. Disregarding his personal safety and the threat to his life, Corporal Milam, in the midst of enemy bullets, moved to a new position where he could place more effective fire on the enemy. It was during this daring act of bravery that Corporal Milam was mortally wounded. His actions were an inspiration to the men around him and spurred them to victory. His personal courage and devotion to duty are in keeping with the highest traditions of the military service and reflect great credit upon himself, his unit, and the U.S. Army.